If you're looking for a weekend movie for the kids and the entire family (long weekend again! ), Minions is definitely recommended. 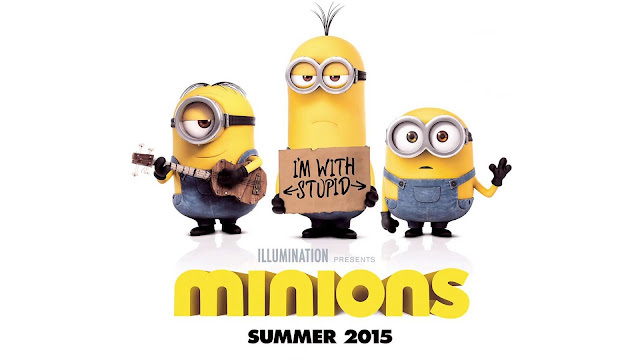 Minions is a hilariously entertaining prequel to the Despicable Me movie franchise. And despite seemingly glorifying villainous characters, there is of course a moral lesson to be learned from the story; even villains are good-hearted deep inside. Minions always had this personality of being followers of a nasty leader since ancient times. But they always end up messing things, leading to seeing their new leader dead. They found solace in an icy cave due to this, only to be bored to death after hiding their for a while. This is where Kevin (if you recall is Gru's most prominent minion in Despicable Me) steps in to start a quest for a new boss. Bob and Stuart tags along. The story then brings us to England when Queen Elizabeth II was just newly crowned. The minions were hoping to follow Scarlet Overkill, the most popular villain at that time by attending the Villain-Con (yes, there is a convention for evil :) in Florida. The minions were successful in their quest and was soon under Scarlet and her husband Herb's (an inventor) bidding. They also successfully stole the Queen's crown and even the kingdom. This made Scarlet furious even after the minions gave up their ruling rights to her. Surprisingly, based on this prequel, minions actually evolved like prehistoric organisms. I always thought they were created by Dr. Nefario, Gru's inventor. The doctor had a short appearance during the crook's event/gathering by the way. I loved Sandra Bullock's voice behind Scarlet, Jon Hamm as Herb, Jennifer Saunders as the Queen, and Pierre Coffin as all the minions. I can only speak for two kids I watched the movie with and they were very entertained throughout the duration of the screening. The same applies to all the other kids who were in the same cinema when he watched. Both young and old were laughing all the way. Catch the Minions in a theater near you this weekend!